When it comes to kids brushing teeth, instilling good oral hygiene in your child is critical for the health of their teeth for years to come. We understand that it can be hard to make sure your child is brushing properly and for long enough, so we’d like to offer you a few tips on how to brush your teeth to help make the process smoother for you! Set a timer. Your child should be brushing his or her teeth twice each day for two minutes each time. 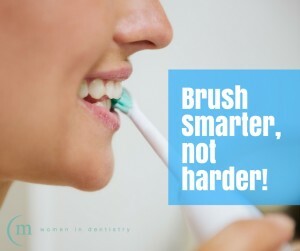 Consider keeping a timer in the bathroom and teaching them to set it for two minutes when it’s time to brush. Make it a game. Give your child a sticker each time they brush their teeth for the appropriate length of time. After they collect a certain number of stickers, offer them a small reward for proper brushing etiquette. Brush with them. This gives you a chance to teach them the proper technique and you’re able to ensure they’re doing it correctly. Let them pick out their toothpaste. The next time you’re shopping, give your child a couple of options for their own toothpaste and let them select which one they’d like to use. Keep it positive. Stay away from telling kids brushing teeth that they’ll have to “see the dentist” if they don’t brush their teeth, which can be seen as a punishment—even though it’s a lifelong requirement! Is it time to book your child’s next dental cleaning? Feel free to give your dentist Melbourne CBD a call to schedule their next appointment. We look forward to seeing you!